We have divided our lodgings into three classes to meet your requirements precisely: Premium, Comfort and Classic. Choose your dream apartment from our large offer or book an arrangement - consisting of accommodation in Croatia with motorboat. You have the choice! If you want to rent a yacht in Croatia, Croatia-Adriatic is the place for you! In our boat rental, located in the SCT Marina in Trogir, our qualified staff and specialists from the area of ​​boat charter and boat rental offer a first class service. 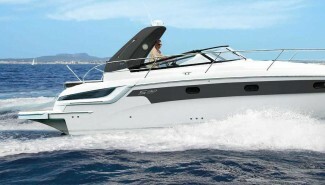 Our competence in motorboat and yacht charter is unmatched in Croatia. If you spend a holiday in Croatia with boat moorings, leave the stressful everyday life behind and immerse yourself in one of the most beautiful regions in Europe. At Croatia-Adriatic we are proud of the beauty of our homeland. We are equally proud of the arrangements we offer you here - seven days holiday by motorboat, accommodation and boat included. Croatia-Adriatic welcomes you on the beautiful Adriatic coast, between Šibenik and Makarska including their offshore world of islands. In this unique landscape and beaches, particularly inviting with its crystal clear water, we offer luxurious villas, comfortable cottages and cozy apartments. At the same time, we are one of the largest yacht charters in the country – whether motor yacht, catamaran or luxury yacht: Croatia-Adriatic has the right boat for you! Experience unforgettable days in our luxury holiday accommodation, on our high quality yachts or enjoy a Croatia-Adriatic-package that combines the best of both worlds Charter! Yacht charter and Croatia – two words that just fit together!
. . . more pleasure motorboat in Croatia – does not exist! Split has the biggest port in Dalmatia. In addition to the attractive promenade, the UNESCO-protected Roman ruins of the Diocletian’s Palace, the picturesque fort of Klis and many other cultural monuments, Split is especially proud of its beautiful beaches. By the way: Besides Dubrovnik, Split has also become the filming location of the acclaimed TV series “Game of Thrones”. A marked trail leads to individual venues. Trogir is also rich in cultural and historical monuments, stunning architecture and beautiful little streets – which is what has earned the city, also on the UNESCO list of world cultural heritage, the nickname “Little Venice”. Our islands lure with fantastic scenery and captivating story that goes back to ancient times – perfect for yacht charter. Hvar, for example, the fourth largest island in the Adriatic and known to the ancient Greeks as Pharos, offers some of the finest wines of the region. Brac invites you to a stay at the famous Dalmatian beach – the “Golden Horn”. Vis was chosen for its strategic location known as the “Gibraltar of the Adriatic”. Here you will also find the “Tito-cave”, which is said to have organized the resistance against the German occupiers from Josip Broz Tito in the Second World War. Plus, the honey from Šolta is considered one of the tastiest in the world. So whether you want to learn about culture, country and people, relax on the beach or sail as a captain on a Yacht Charter in Croatia: With a holiday in Croatia you will enjoy the most beautiful days of the year exactly as you want it! You simply choose the place – Croatia-Adriatic does the rest! By choosing a motor boat charter in Croatia with the new Finnmaster T8 embark with maximum comfort and safety in one of the finest nautical spots in the world. As you enter you can feel the high-quality workmanship. From the stern to get a spacious and comfortable U-shaped seating in the Designed for up to 10 people large cockpit. The three bucket seats give in driving a good grip, the view is even at high speed even when sitting well and wind protected. The instruments are arranged noble and very clear. Below deck, the Finnmaster offers T8 two comfortable cabins, each with two fixed beds [without table rebuilding] and a separate wet room with sea toilet. In this tour equipment motorboat is therefore also suitable for longer trips for up to 4 people. At this facilities include Camper canvas, Bimini top, Shore connection, kitchenette mi gas stove, sink and refrigerator, stern shower, GPS navigation, bow and stern thruster, radio-MP3 sound system, el. Anchor, and lots more. We would like to share with you our passion and love for Croatia and our knowledge of the region of Dalmatia along with its nautical uniqueness! From day one, you will feel at home – we stand by our word! Croatia-Adriatic is a holistic touristic and yacht charter company in central Dalmatia. Our area of activity extends from the north-western Šibenik to Makarska in the south of the mainland. The offshore Dalmatian islands – Solta, Hvar, Brac, and Vis -are also included. Our Croatia yacht charter-region is one of the most magnificent places in Europe. Even the nautical experts rave about one of the most beautiful areas in the world. A centerpiece of this area are the World Heritage cities of Split and Trogir.